Will Penny: When I come back you gotta be long gone. This here's the line rider's shack. Catherine Allen: Hey Mr Penny, who is the line rider? The archetypal western hero is a man of independence, strong of character, and void of outward emotion. He displays a reluctant bravado, not usually the instigator of trouble, but always willing to rise to a challenge and meet it head on, despite the odds. It is a romanticized image, and one that doesn't fully explore the depths of a life of solitude and hard work. For his first major feature film, TV director Tom Gries decided to create a more realistic persona, one that reflected the true character of a man who has chosen a life on his own, without glorifying the image or delivering fairy tale endings. His screenplay brings the characters and an authentic rendering of the old west to life in Will Penny. 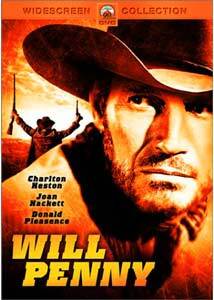 Will Penny (Heston) is an aging career cowboy. Nearing fifty, he has never learned to read or write, and existed in a transient fashion moving from one job to the next. He has a pleasant and generous demeanor, but can hold his own when necessary. After giving up a job to a young buck so the boy could see his father one last time, Will sets off in a wagon with two companions, Blue (Lee Majors), an inexperienced cow hand, and Dutchy (Anthony Zerbe), a more seasoned foreigner. With winter approaching, the trail is hard, and fresh meat a rarity, but when the chance for a deer creates a confrontation with a crazed preacher (Donald Pleasance) leaves one of his gang dead, the man swears revenge against Will, who brought him down in self defense. Dutchy is also wounded, and prospects for his survival without medical attention are slim. At a roadhouse, Will first comes into contact with Catherine Allen (Joan Hackett), a woman travelling across country in search of her husband, who had gone on ahead and left her and her son (the director's son, Jon Gries as Horace Greeley Allen, aka Button) in the care of a guide. After parting ways with his companions, Will heads to the Flatiron Ranch where he gains employment for the winter as a line rider, whose job is to keep squatters and settlers off the ranch property. He will be alone for the duration, staying in a remote cabin, but when he arrives at the building, he finds Allen and her son holed up after being abandoned by their guide. He advises them to be gone by the time he returns from his rounds, but runs into Preacher Quint and his sons while on patrol, and is stabbed in the chest, stripped of his clothes and horse, and left for dead in the cold winter climate. His only hope for survival is the care of the woman who is occupying his home, but whose presence puts him at odds with his employer. Can this grizzled loner give up his solitary life, or is his fate to remain detached from the love and sense of home he had only dreamed of? The storyline balances the conflict between Will and his enemies with a love story that seems doomed from the start. We witness the emotional side of the cowboy, as he grows attached to a married woman and her son, and sees a life he never thought possible. Heston does a magnificent job in the role, free of the melodramatics found in some of his other work, like Ben Hur or Planet of the Apes. He presents a good-hearted character who discovers a world he never thought he would find, but is also a realist and knows his own limits. Joan Hackett is a perfect match, formidable as a foe, yet understanding as she uncovers the truths about the man with whom she shares company. Donald Pleasance makes a worthy adversary, possessed and unpredictable in his ravings, with Bruce Dern serving a cool, cruel and vindictive son. Anthony Zerbe adds a touch of humor as the exaggerating Dutchy; look for Slim Pickens as a frazzled chuck hand and Ben Johnson as a ranch boss. The film was also the big screen debut of Six-Million-Dollar-Man Lee Majors. The cinematography is wonderful, capturing the rugged majesty of the mountain settings, and heightening the action with a transparent presence. Will Penny achieves a rare outlook on the old west, and a strong character study of the cowboy. Image Transfer Review: The anamorphic 1.85:1 image is extremely good. Colors are strong and earthy, blacks are solid. Fine grain is rendered well, with little in the way of source or compression defects. There is a hint of haloing at times, but otherwise this is a natural looking image. Audio Transfer Review: Mono audio is presented well: clean, with few signs of distortion or hiss. Tonal balance is even with no excess sibilance. This serves the film well, never calling attention to itself. Extras Review: Two recent interview featurettes make up the extras. The first, Remembering Will Penny, (13m:20s) features Charlton Heston recounting his impressions of the film and his costars, and his attraction to the project. Jon Gries, the director's son, also recalls how his part was cast, and Western historian, Miles Wood Starthout, tells the lengths the producers went to be as authentic in their presentation as possible. The Cowboys of Will Penny (03m:26s) has Heston and Jon Gries commenting on the rest of the supporting cast, with brief excerpts of each character. Will Penny is a great addition to the Western collection, portraying a side of the cowboy that is rarely explored, supported by a strong script and capable cast. The direction is flawless, and the story memorable. This one comes highly recommended.